When I found these adorable Frankenstein containers in the Dollar Spot at Target, I knew I had to create some fun Halloween centers! Want to win the unit that contains 6 CCRS aligned LA centers? Head over to the facebook page and enter! Or you can grab your copy immediately by clicking here. 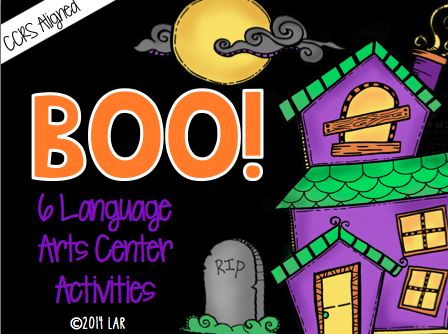 These language arts centers are great, but the blackness of the bat game have a few errors. It says "I love the cameral apples." Bloom's Taxonomy Ladders: Non Fiction!